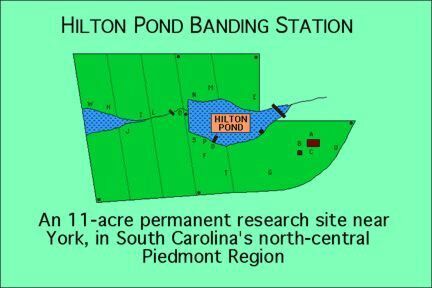 Hilton Pond Center for Piedmont Natural History is a 501(c)(3) non-profit organization based in York, South Carolina USA. It oversees Operation RubyThroat: The Hummingbird Project as part of its education and research activities and serves as the clearing house for information collected by project participants. Hilton Pond Center has been in operation as an educational and scientific research site for more than 20 years. It was established on an old Piedmont farmstead in 1982 and has been a field trip destination for school groups, college classes, environmental organizations, and others interested in conservation and nature. From 28 June 1982 through April 2008, executive director Bill Hilton Jr. has banded more than 50,000 birds of 124 species on the 4.5 hectare (11-acre) tract, making it one of the most active banding stations in the southeastern United States. Included in those totals are more than 3,600 Ruby-throated Hummingbirds (Archilochus colubris). 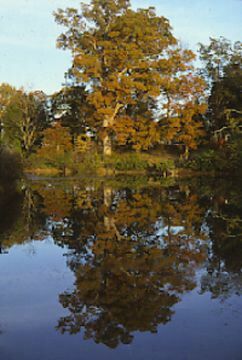 This large White Oak (Quercus alba) at Hilton Pond Center for Piedmont Natural History is one of many native trees, shrubs, and wildflowers that provide food, shelter, and space for birds, small mammals, reptiles and amphibians, insects, and other wildlife. Hilton Pond is one of the most active bird banding stations in the Southeast and the site for several award-winning research projects by elementary and high school science students. Hilton Pond Center for Piedmont Natural History was formally incorporated in 1999 by its board of trustees, with Bill Hilton Jr. serving as executive director. The Center is recognized by the State of South Carolina and the federal government as a 501(c)(3) non-profit organization. An award-winning science educator and nature writer, Hilton holds a Master Permit (#21558) from the federal Bird Banding Laboratory in Laurel, Maryland. He has conducted and published in-depth research on Ruby-throated Hummingbirds, House Finches (Carpodacus mexicanus), Purple Finches (C. purpureus), and Blue Jays (Cyanocitta cristata) and frequently publishes newspaper and magazine articles about natural history. In 1999, Hilton Pond became the southernmost site in a national network using night-time banding to study dispersal of Northern Saw-whet Owls (Aegolius acadicus). Through August 1999, only four saw-whets had ever been banded in South Carolina--the latest in 1972. Since November 1999, Hilton has netted and banded ten of these diminutive owls from the forests of Canada. Hilton Pond Center for Piedmont Natural History includes an active bird banding station. Net lanes (marked by capital letters) are established along the margins of two ponds and various kinds of traps are located around the two buildings (red rectangles). MOre than 50,000 birds from 124 species have been banded on-site since 1982. Most Ruby-throated Hummingbirds are caught in pull-string traps at locations A, B & C.
The Center was also the site for intensive three-year research project on the ecology of small mammals of the Piedmont--a significant study conducted by a high school student whose work received top awards at the 1994 and 1995 International Science and Engineering Fairs. Another student project on Pine Siskins (Carduelis pinus) was accepted for presentation at the 1985 South Carolina Junior Academy of Science research competition. A third student had similar science fair successes at the elementary and junior high levels for research on bird abundance and avian habitat preference. Students and visitors have also helped compile comprehensive checklists and photographic records of flora and fauna that occur at Hilton Pond Center. In October 1999, Hilton Pond Center unveiled Operation RubyThroat, a cross-disciplinary international project in which students, teachers, and others collaborate to study behavior and distribution of Ruby-throated Hummingbirds. Participants live in the United States, Canada, Mexico, and Central America (Belize, Costa Rica, El Salvador, Guatemala, Honduras, Nicaragua and Panama)--countries in which this bird regularly occurs. Because Ruby-throated Hummingbirds typically tolerate people and are even drawn to flower gardens and hummingbird feeders we provide, they are an ideal subject for natural history observation and research by students and adults of all ages. Participants in Operation RubyThroat are be linked via the Internet and World Wide Web and especially through the project's website (www.rubythroat.org), which averages more than 250 main page hits each day. Operation RubyThroat is being implemented in stages, with the start-up year (Year One, or academic year 2001-2002) involving teachers and students in the Carolinas and New York; Year Two (2002-2003) expanding to all 38 states within the breeding range of the Ruby-throated Hummingbird; and Year Three (2003-2004) including Canada, Mexico, and Central America. Research studies at the Center have been funded in part by small grants from the South Carolina Department of Natural Resources, Perky-Pet (manufacturer of hummingbird feeders), Sigma Xi Scientific Research Society of Clemson University, and the South Carolina Junior Academy of Science. The Center welcomes in-kind and financial donations from individuals and organizations to underwrite its important research and education activities (see Funding & Donations).